In 2017 I was feeling Mother Proud! Sander became a Deputy Chief Fire Marshal, Northeast Regional Commander, Maryland State Police. My "Baby Boy" was supervising a dozen Fire Marshals. His "Big Boss," Brian Geraci, whom I met for the first time at 2am Dec 8, 2017 when he came to tell us Sander was dead, were on the same page. We both believed in the "Sandman". Before that, every Tuesday when Sander came over for dinner he and I searched on-line for his first house. He said it had to be in his buddies neighborhood and have good schools for his "future family". I was beyond happy! House, family, a daughter-in-law, grandchildren! Cool!!! My husband, Neil (PopaDoc), and I could see our families fabulous future coming to fruition. Then our dreams died. An illegal alien hit and killed my son and FBI Special Agent, Carlos Wolff, when he stopped on a Maryland highway to help Carlos who had hit the Jersey wall. Sander was a Volunteer Firefighter at RVFD, known as the "Rock". Medics he had worked with responded to the horrific scene. I was told there were 1600 people at Sander's funeral. I sort of heard Sander's friends and colleagues speak. I remember seeing 100s of men and women in their police and fire dress clothes. I saw people standing by the road in the cold for miles as we followed the fire truck carrying my dead child to the cemetery. I spent the first year in the company of angels. I'm getting my happy back one day at a time. I went to Police Week and saw Sander's name engraved on their Memorial Wall. At National Fallen Fire Fighters, I saw his name engraved on their Memorial Wall. 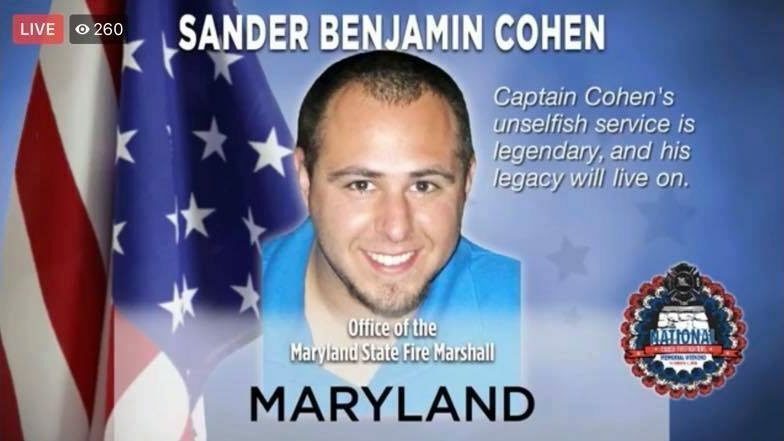 We went to the Headquarters of Maryland State Police and I saw Sander's name engraved on a Memorial. RVFD invited us to be Lifetime members. I see Carlos' widow, Marla, and her children every week. Sander's friends have invited us to their weddings. We help out at the firehouse and I am part of the Angel Families. We are bonded for life.